The Black Panther's origin is retold in a cinematic scope with social satire and all-out action. Marvel has big plans for the Panther. He’s destined to become a key player in the Marvel Universe this year, so reader, get on board now! There was a lot of trepidation with this issue. Can it compete with what Priest’s created, can Hudlin write translate his passion to the page (check out the interview, he’s a safe cat). Well, the answered was a resounding YES!!! This was a fantastic opening issue and I’m honestly not jus saying that. 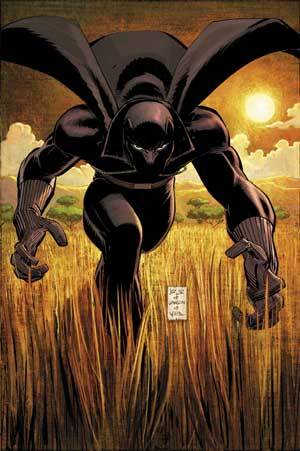 From the outset Hudlin puts into the readers mind, jus what the Wakandain’s are about. I’ve heard complaints about the way the tribesmen talk, but its translation, so it perfectly fine within the story. We get to see some excellent inter character communication. A familiar face makes an appearance and a plot is revealed. Amazing Spider-man and now Wolverine both look real good, but this, this is truly some of Romita’s GREATEST work. The opening pages are amazing, even the blades of grass impress, that’s how good it is and at no point are the images disrespectful. The scenes set within the prison (type place) have a feel of foreboding and there is a sinister air to Klaw, which is fitting. A lot of the atmosphere has to be created to Dean White, who has outdone himself with the colouring plate throughout the issue. Even though the cover has been seen many times, it still has a boldness about it, which is a good proclamation for this new beginning.